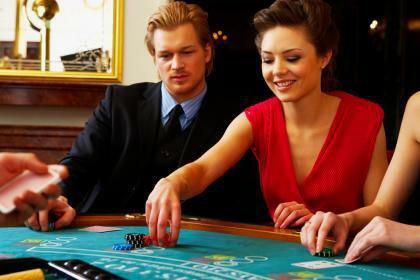 Do not play casino games when you are nervous, tired or angry. Those emotions will only be reflected in the amount of losses you make. Keep in mind that the objective of this casino game is not to get closer to 21 as possible, but to beat the dealer. Follow basic strategy, success at Blackjack (and at most casino games) is often based on mathematical knowledge of the basic rules. Make sure that you know the different values of the cards in Blackjack. When the dealer shows a low card (6 or less) s/he is more than likely to bust. Keep in mind that 6 is more likely to bust than 2. In order to let the dealer bust and not bust yourself do not hit any hands of 12 or higher. If you want to succeed at casino games by counting cards, keep in mind that before you learn to count cards you should know all the basic rules. Unlike other casino games, Blackjack’s basic strategy allows you to play with a tiny 0.5% house edge. If you want to make money at casino games, you should first have a bankroll and be ready to go on losing streaks. For example, to make $25/hr you need a bankroll of at least $25,000 and there is still a 1 in 20 chance that you will lose. Just as in any other casino game, consider rule variations when picking a table. It is recommendable to never use more than 5% of your bankroll in just one hand of Blackjack. New players at the table will likely bet more than 5% of their bankroll in every hand and you should take advantage of that. If you are going to play Blackjack at a live casino, make sure you know the basic etiquette rules. Do not buy insurance when you play Blackjack, it will only hurt your winnings in the long run. Every good casino games player, no matter if they are losing or winning, knows when it is time to walk away. If you are new to online casino games like Blackjack, play at an online casino and observe their auto-play option until you understand what it is doing. You should split pairs of Aces and 8’s, but don’t do this on any face cards or 10’s. Variation is the key to casino games: vary the amounts you bet according to your results. Some players recommend that you always hit when you have a 9 or lower. Hit on any hand valued between 10 and 16 ONLY if the dealer’s face up card is a 7 or higher. Have fun, but do not get lost in the excitement of the games and try to play with full concentration.